Can I just mention how much I like getting pictures of people dressed as my characters? Because that was always totally rad. 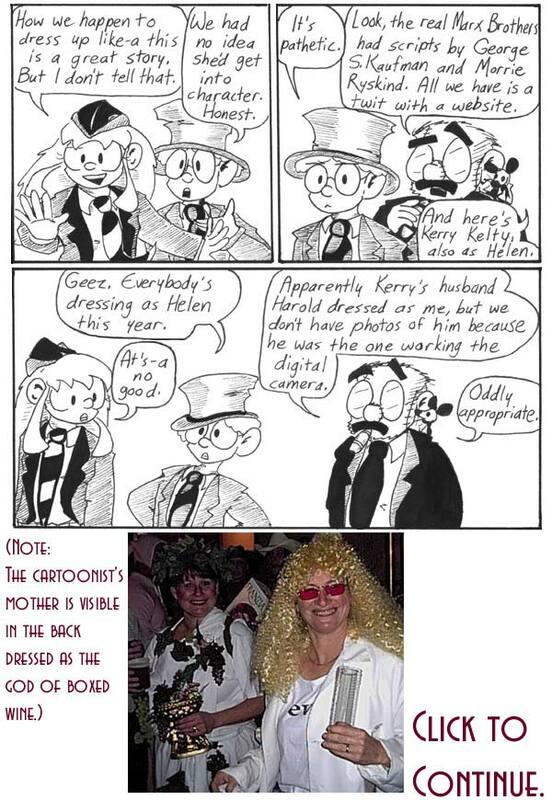 It made me very happy that I always had a little cosplay to show off in the annual post-Halloween roundup. Happy, and a little scared. 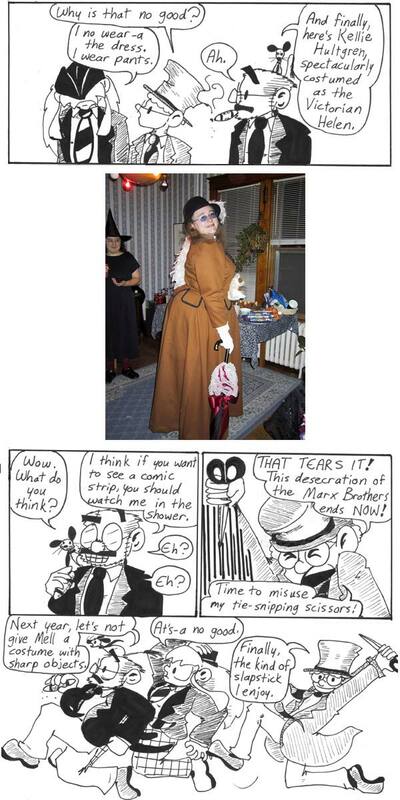 I mean, dressing up as the characters in a little-known webcomic is a pretty strong show of support. As mentioned previously, Andrew and I dressed as Chico and Harpo Marx for Halloween that year, so the Narbonic cast is just following our lead. It actually worked out relatively well, even given that Dave has to be not just Groucho, but Zombie Groucho. Kerry is my aunt. And, yes, that’s my actual mother dressed as the God of Boxed Wine. I don’t make these things up. I’m not creative enough. I never did get to see what my uncle Harold looked like as Dave. He’s a beardy computer technician who used to chain-smoke. The role would not be what you’d call a big stretch for him. 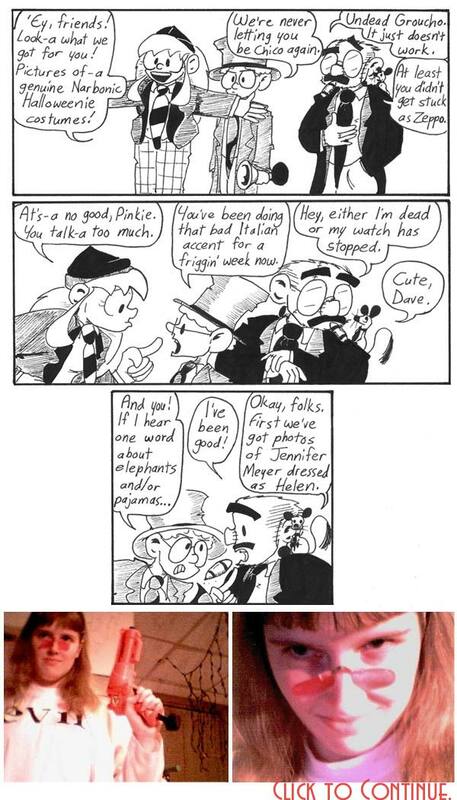 Actually, Harold was pretty much my model for nerdiness when I was growing up, and certain aspects of Dave’s character (like the smoking) probably owe a lot to him. Kerry was my model for everything else in life. Man, I dig that Victorian dress so much. Nice one, Kellie! Oh, good lord, I just noticed Artie is wearing a little bitty necktie. I like the Victorian Helen. Also: DUCK (Soup)! Mell’s coming!! Wait! Wait! We didn’t get to the musical duet! “Time to misuse my tie-snipping scissors!” is a pretty excellent threat.